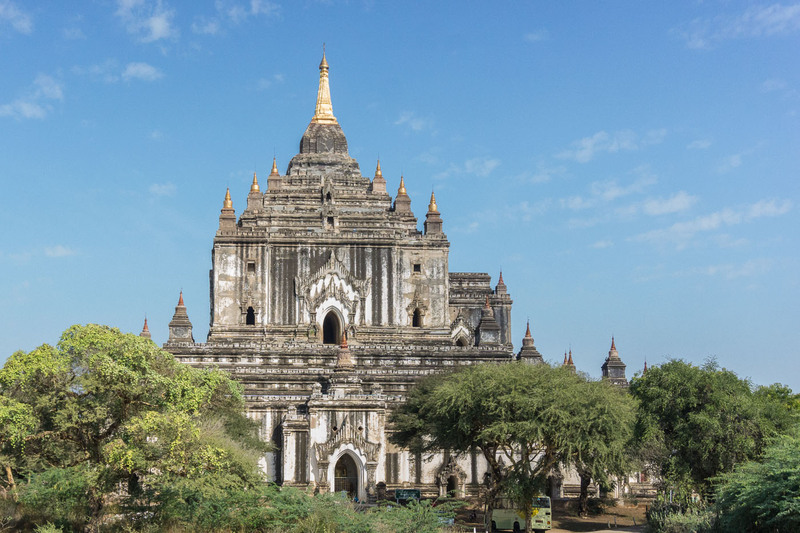 The balloon ride over the plains of Bagan would be an hour-long “wow” as I took in the brick remains of what must have been an impressive capital city some eight or nine hundred years ago. Not agreed upon is just how many people lived here – estimates range from a likely 20,000 to an unbelievable 2,000,000! In any case, while all the everyday wooden buildings have disappeared over time, the much more durable religious structures still dot the plains, a testament to the power of belief to motivate people. Both before and after the balloon ride I had almost three days to get a closer, even if incomplete, look at some of the major stupas and temples and monastic complexes. 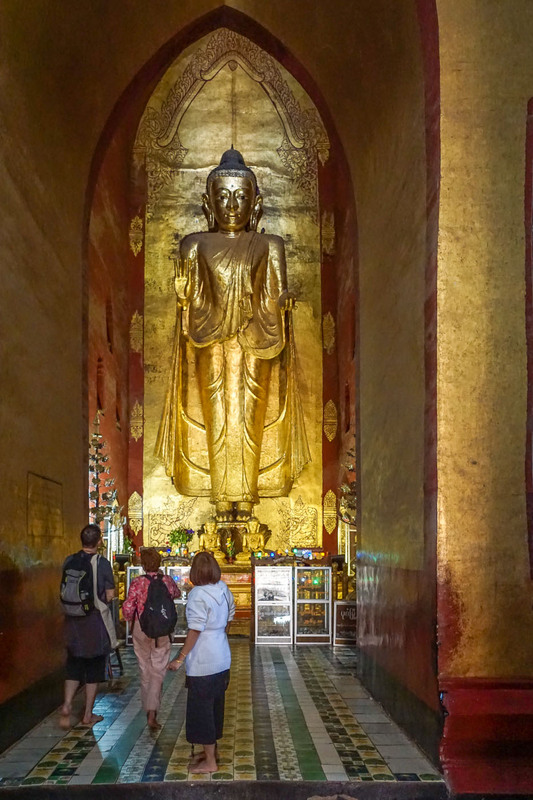 While the architecture itself is often impressive, the overriding impression I got of the statuary was this – poorly realized and clumsy Buddha statues whose lifeless quality left me cold. 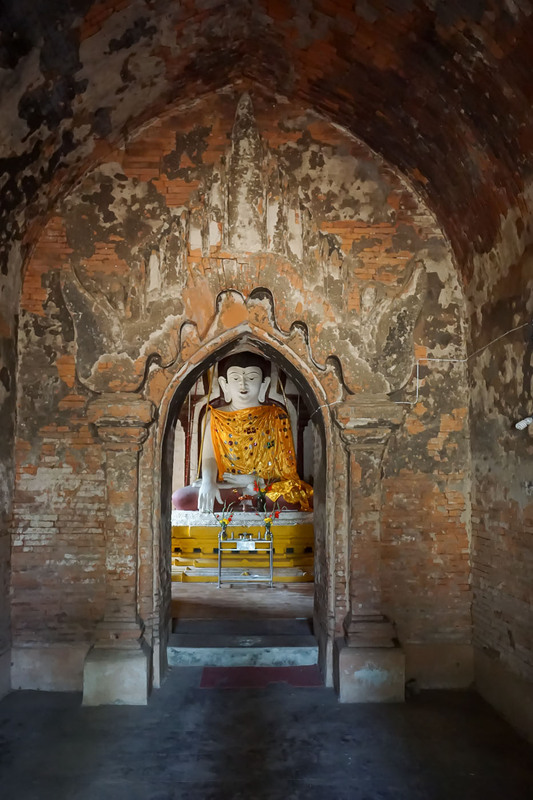 The hundreds of brick images within temples were nearly all renovated during the 1990’s and are now covered in loud colours clashing with the surrounding ancient stucco and murals. 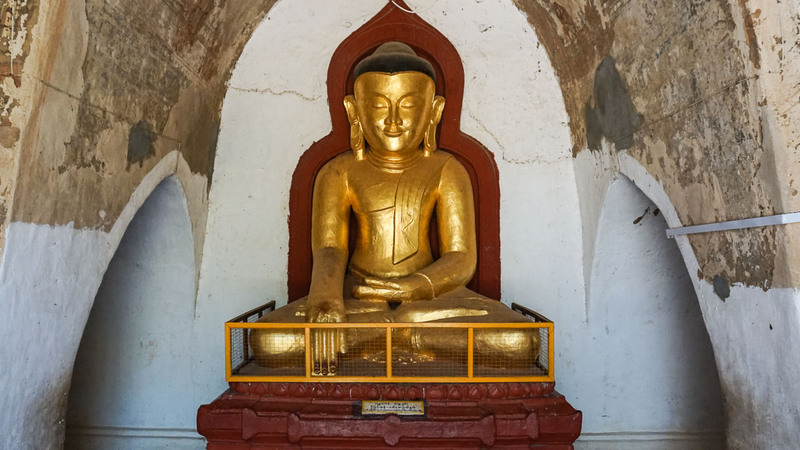 Stadtner writes that five centuries of looters searching for relic boxes contained within the brick and stucco Buddha statues means that most had been smashed open before the British even arrived. Prime areas to search were the head, the centre of the chest, and beneath the figure. Murals and paintings survived simply because they did not contain what the looters were looking for. Instead, they would be covered over by the whitewashers! 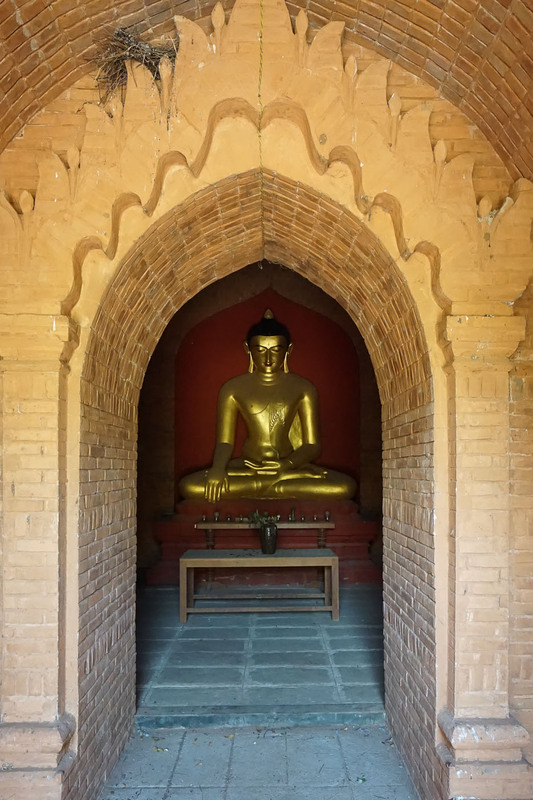 A short walk from Thatbyinnyu is the above temple, a recreation of the original Mahabodhi temple in Bodh Gaya at the very spot where Siddhartha Gautama became the Buddha. 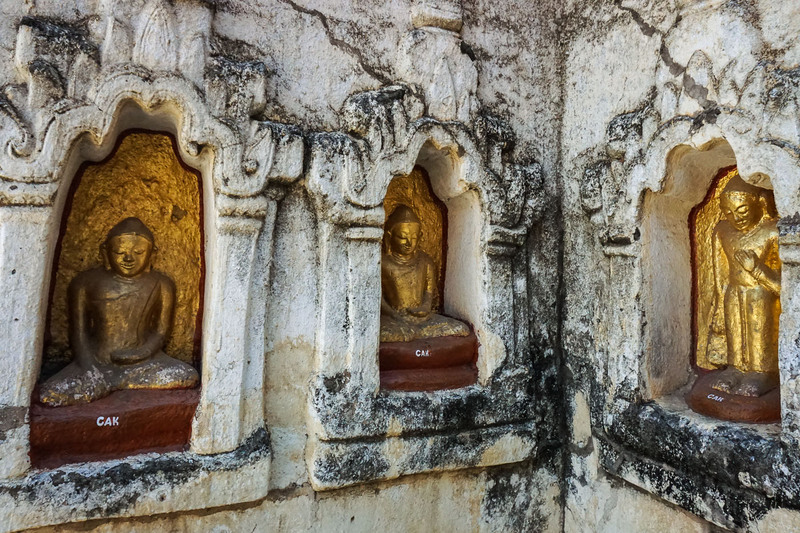 In niches around the external perimeter were these rather crude Buddha figures with one in a standing position. I am not sure what they are made of – wood or stucco covered with gold-coloured paint. 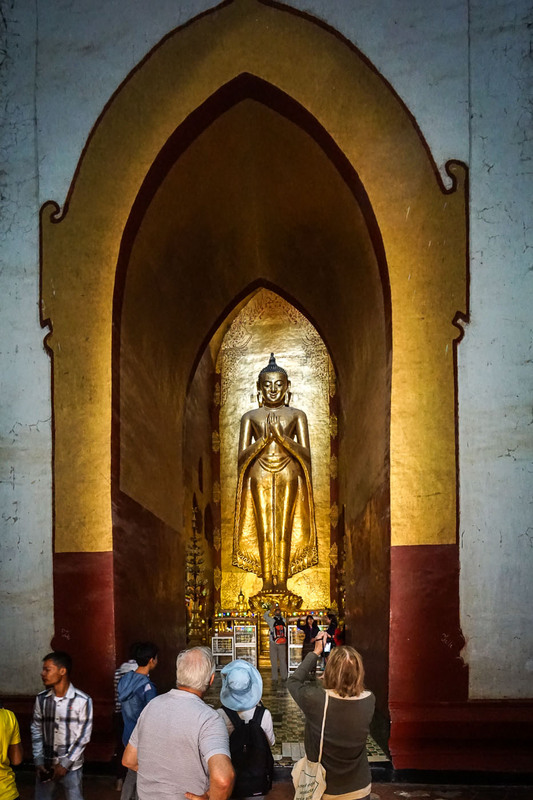 Inside was the main Buddha statue; in the Bagan of eight hundred years ago, that meant a seated Buddha figure. This statue definitely fills the space and you wonder if the proportions of the original did not leave a bit more headroom. 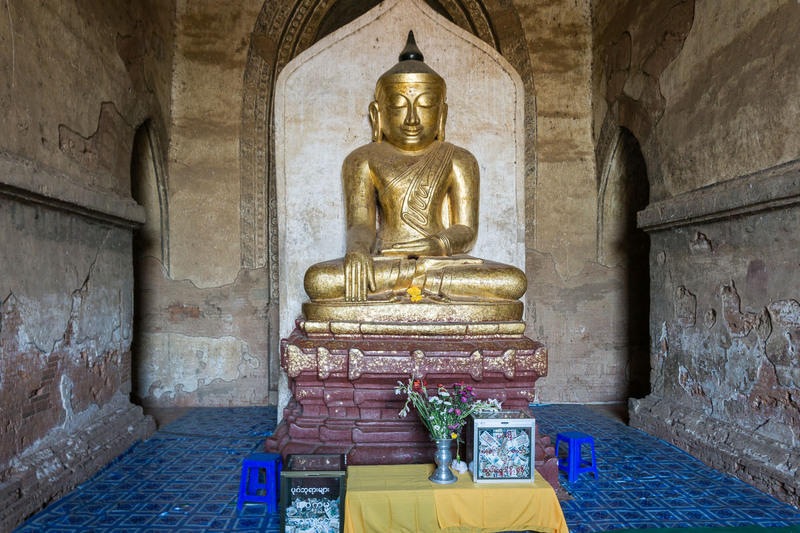 You could wander for days in Bagan and peek into hundreds of minor stupas and temples. 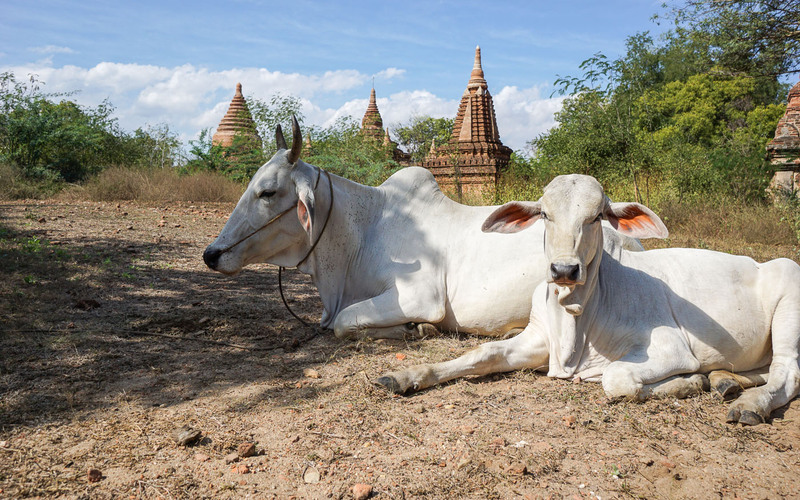 I passed by these two lounging locals on my way to yet another temple entrance. Later I would find my way to the Shwe-zigon just as dusk was approaching. 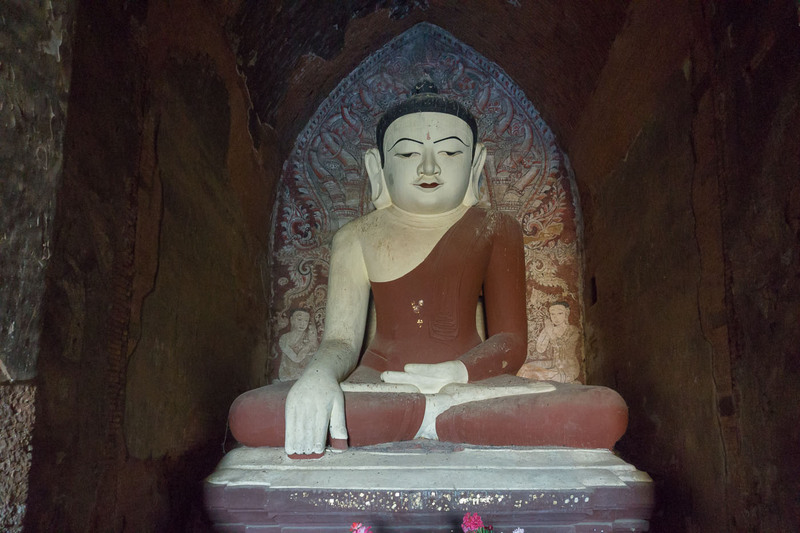 If the Buddha sculptures I had seen during the day were uninspiring, then the Shwe-zigon bowled me over with its beauty. It is a stupa – while there are steps leading up its sides, there is no “inside”. 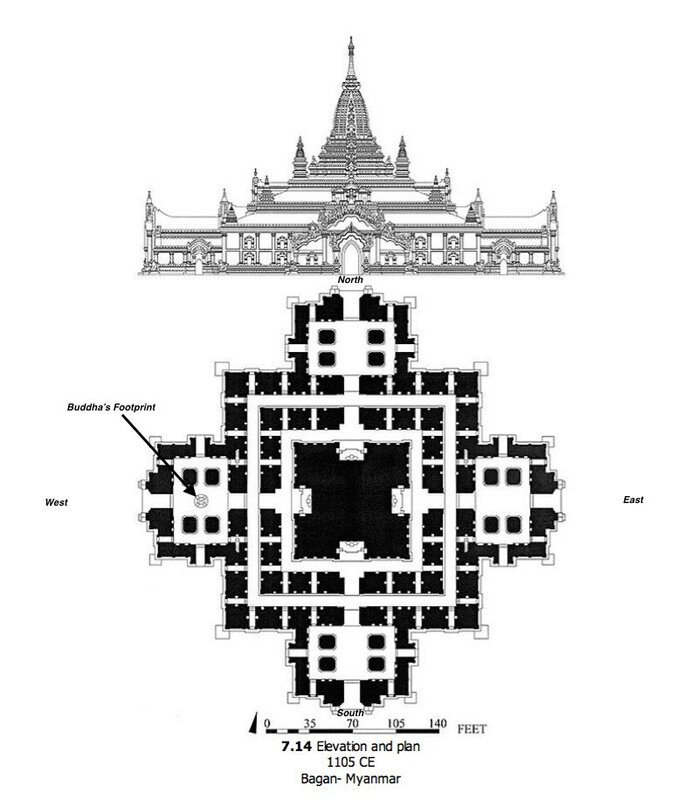 Instead, four temples, one at each cardinal point, serve the purpose of shrine rooms. As I went around the stupa, the one shrine room I did look into is in the photo below. Thankfully the tacky flashing neon light halo around his head was not working! 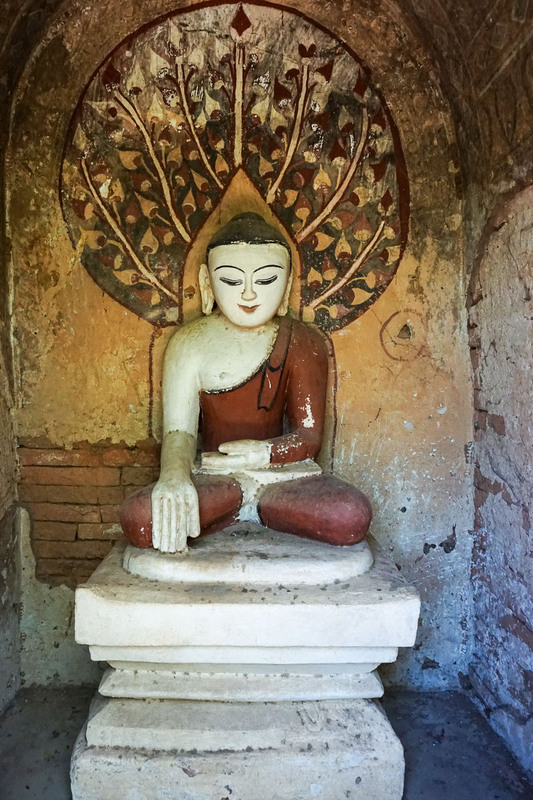 The statue is in the “have no fear” mudra – the open and raised right hand with the left hand also opened. While not as common as the seated “touch the earth” mudra that you usually see, it is the most common standing mudra. And then it was time to head back to the hotel and a good night’s sleep. The next morning we would be getting up extra early – 5:00 a.m – for a balloon ride! 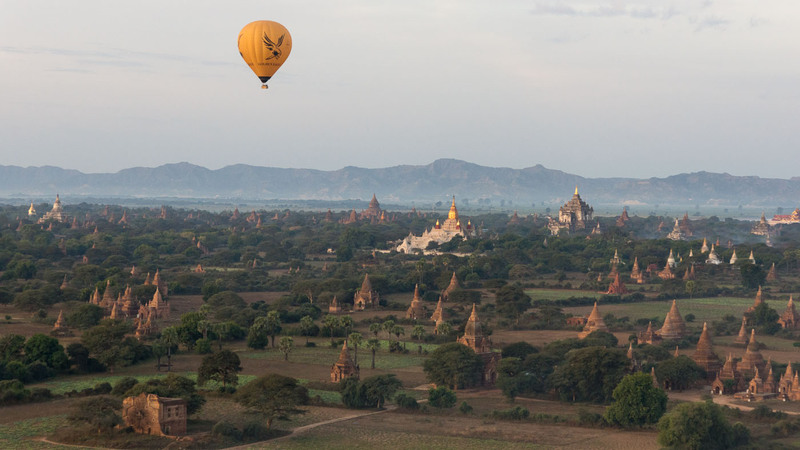 Click on the following link to see what floating over the plains of Bagan at 7:00 a.m. would look like! After the balloon ride it was back to the hotel for breakfast – i.e. something more than the bubbly white wine and croissants served in the balloon landing field not far from New Bagan! 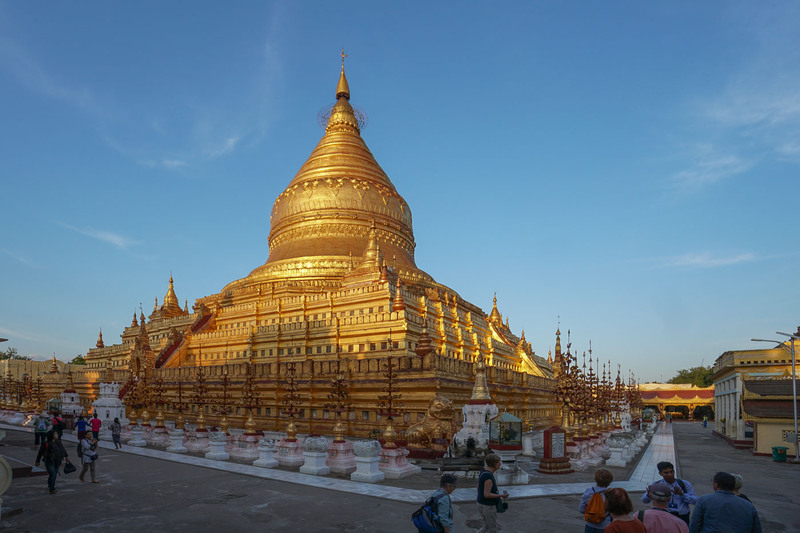 After the balloon ride, it was off to see our last stupas and temples- with visits to Gubyauk Gyi and Dhammayan-Gyi and finishing off with the grandest of them all, the Ananda Pahto. 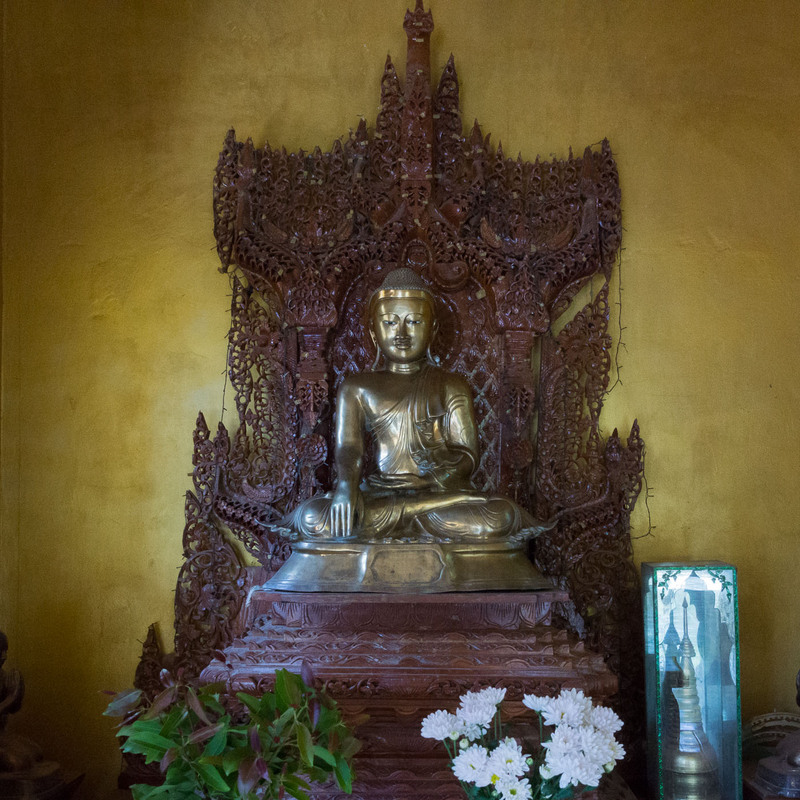 The small bronze above may have been the finest single Buddha figure I saw; since bronzes were not at all common in the Bagan of eight hundred years ago, the piece is probably of fairly recent times. The above figure, with arms almost as wide as its waist, has an almost cartoonish look about it; it looks like it has been recently installed or repainted. 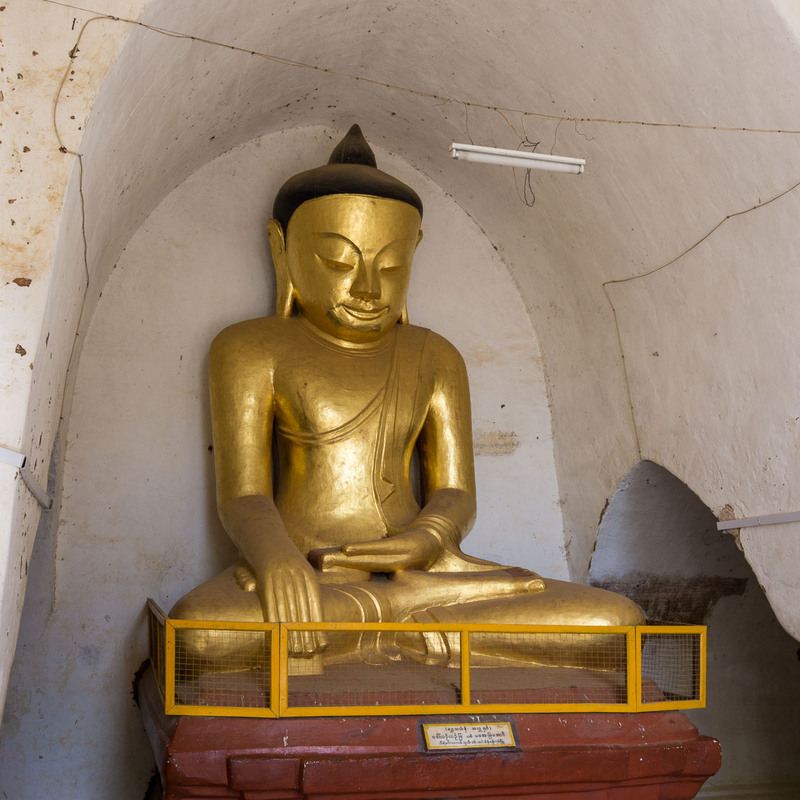 The statue below sits in an alcove which has not been completely restored. Sections of the wall reveal the bare brick underneath the stucco covering. 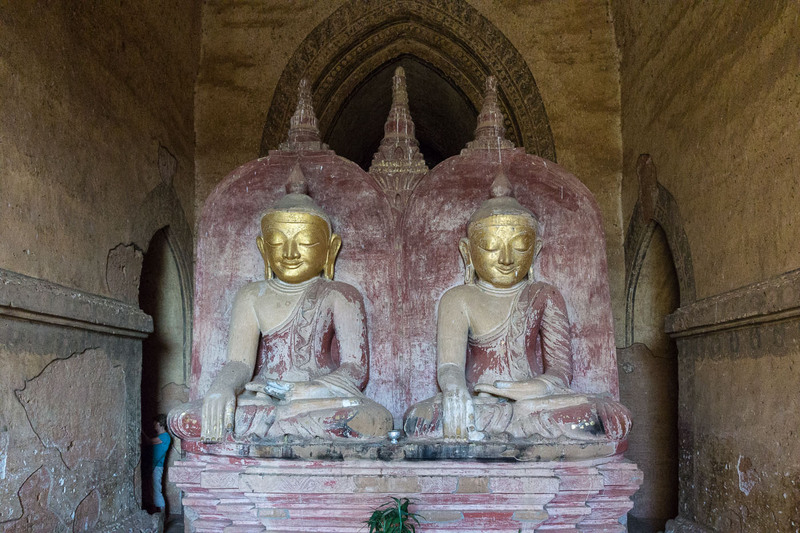 Of all the large-scale Buddhas I saw at Bagan, I was most moved by the ones I saw at the Ananda Pahto Temple. While they are not the ones that originally filled the space, they do so majestically. 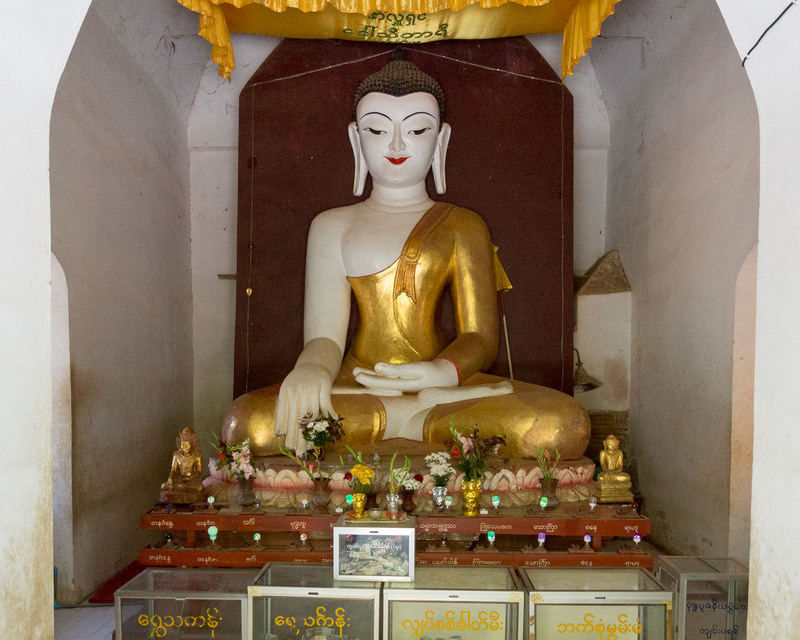 The four wooden Buddhas stand about 9.5 meters high (30 feet) and are the only major temple Buddhas in Bagan which are not in the seated position; this leads Stadtner to conclude that they are not original and likely date back to the Konbaung period (1752 – 1885 C.E.). 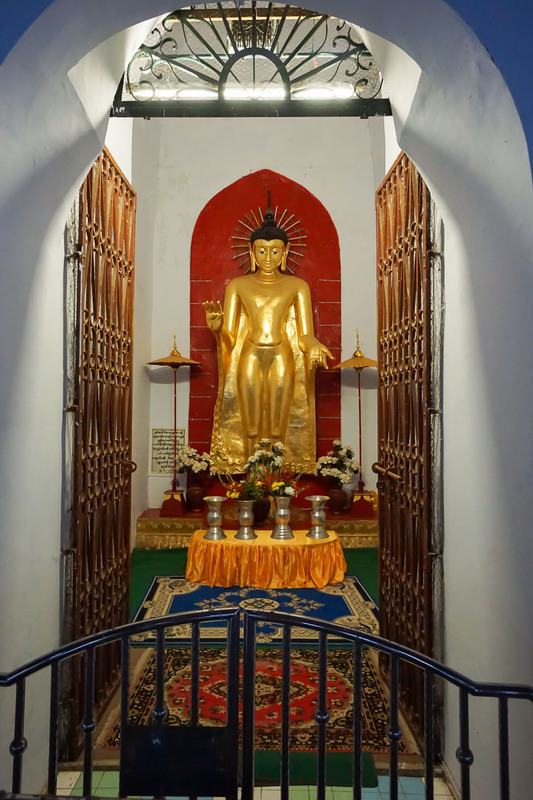 The Four Ananda Standing Buddhas, gilded with fine gold leaf, are located in the niches of the central cube of the temple. See below for a drawing of the pahto. Drawing of The Ananda Pahto from Buddhist Architecture by Le Huu Phuoc. It was the George Luce who assigned the name of a particular Buddha to each of the four statues. He related them to the Buddhas of the present age or mythological unit of time known as a Kalpa. In the Buddhist myth, there have already been four Buddhas with the fifth – Maitreya- yet to come; Luce places one in each of the four niches. So Kassapa is supposedly in the south niche with Kakusandha in the north. 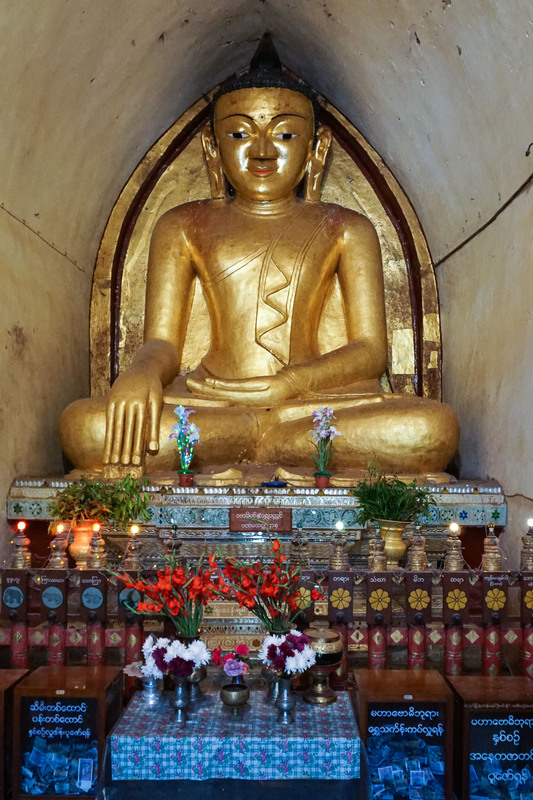 This leaves Konagamana in the east and in the west we have the historical Buddha, Siddhartha Gautama. More recently scholars have questioned Luce’s entire explanation since there is no evidence associating various Buddhas with the cardinal points. The various mudras they exhibit also do not provide any reason for associating them with one Buddha and not another. However, the guidebooks seem to like the explanation and it has taken on the status of fact thanks to constant repetition! 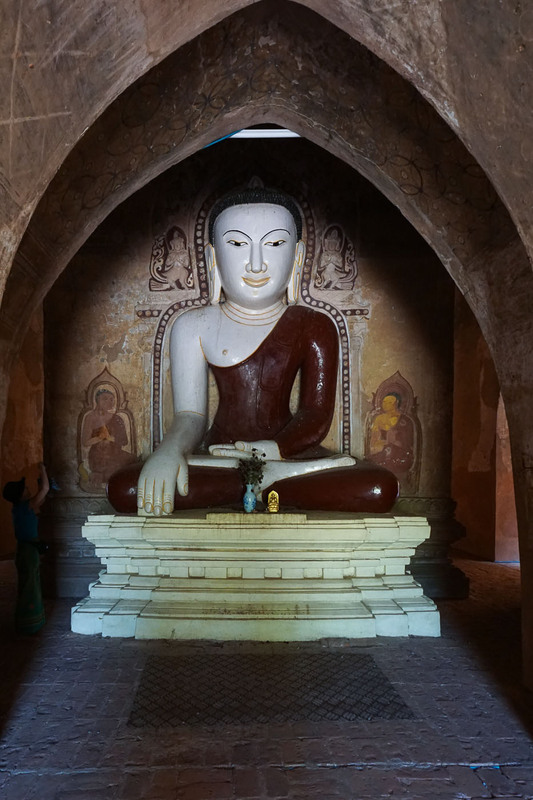 Bagan is really all about the stupas and temples. 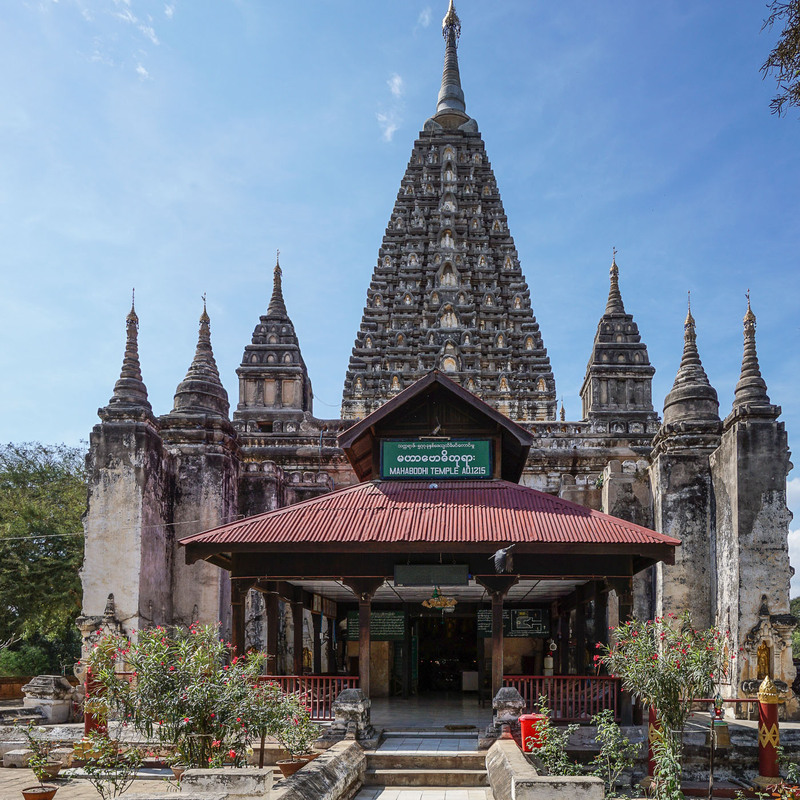 If you are going to be spending a few days in Bagan, you will definitely get much more out of your visit with a good guide. Most will be able to take you to the highlights; some will be able to deliver more than the usual patter and provide more considered insight. 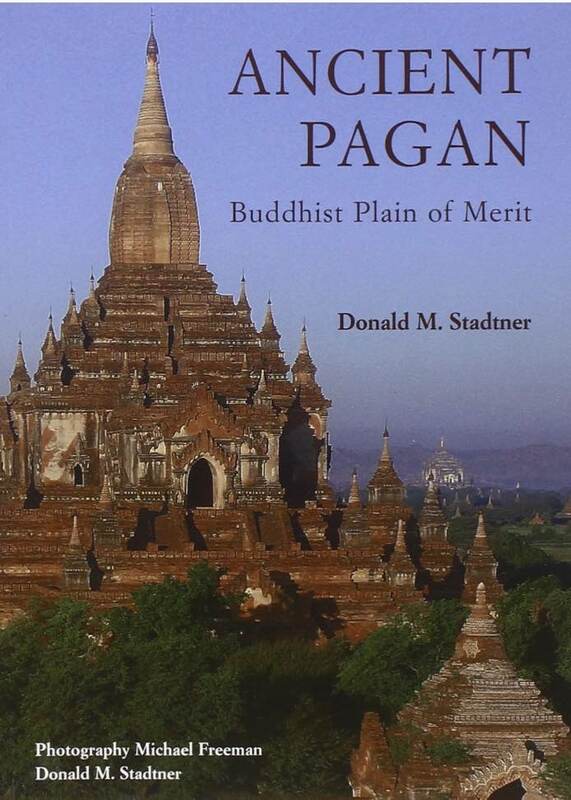 A great book to read beforehand is the 2013 second edition of Ancient Pagan: Buddhist Plain of Merit by Donald M. Stadtner. 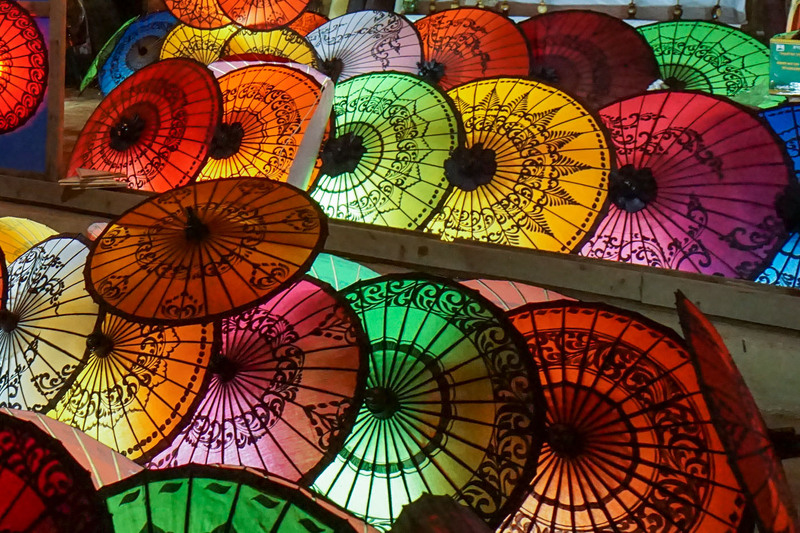 The insightful text draws on the author’s forty years of study of Burmese art and architecture and is beautifully illustrated by the photos of Michael Freeman, a top-notch photographer. The book focusses on thirty-three key structures; you’ll have had an incredible visit if you can see most of them during your stay! 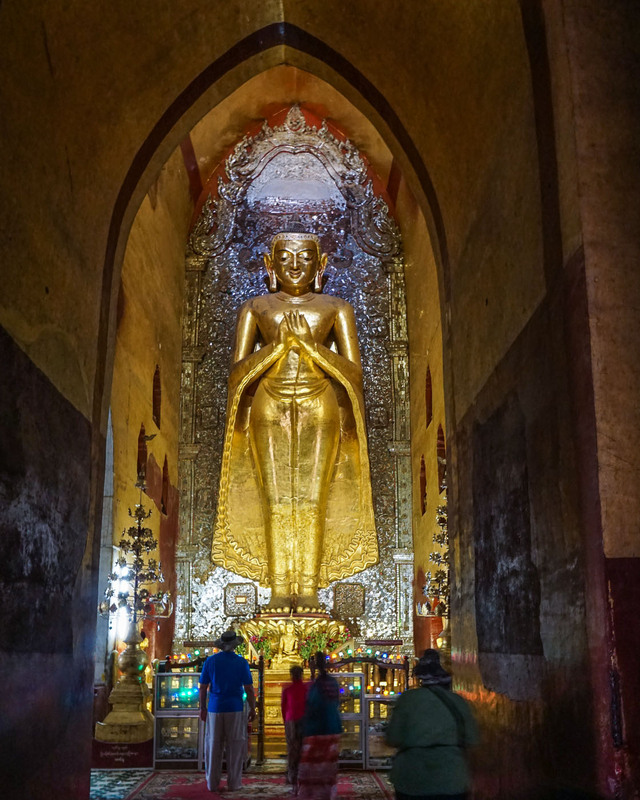 In spite of my occasionally negative comment in this post, Bagan is absolutely worth the visit. 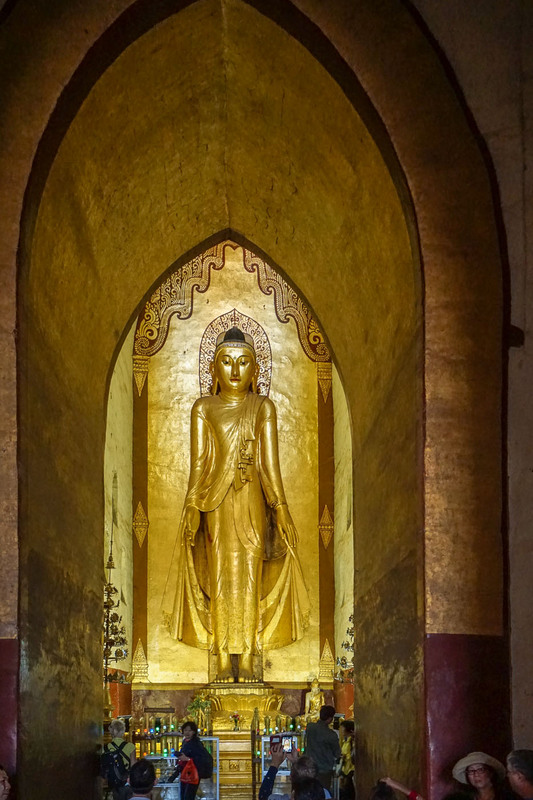 This entry was posted in Myanmar and tagged Pagan Burma Buddha statues; Pagan site restoration; Ananda Buddhas; Bagan buddha statues;. Bookmark the permalink.